“The biggest risk is not taking any risk… In a world that is changing really quickly, the only strategy that is guaranteed to fail is not taking risks. Zuckerberg is right in his observation. He took the risk of leaving his college studies to chase his dreams. And today, the world knows him as the youngest billionaire. In fact, a host of people like Zuckerberg took the risk of dropping out from their respective colleges to fulfill their aspirations and emerged as one of the richest persons of their time. 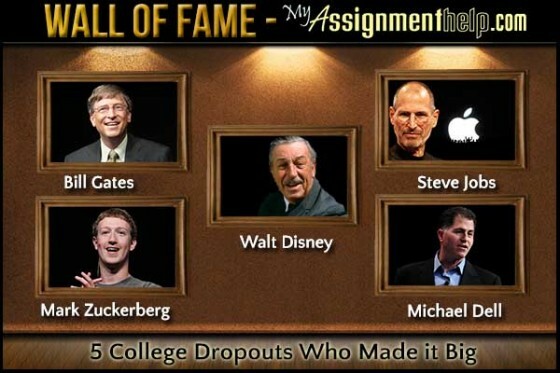 They all proved that formal education does not always influence your future. Lacking a college degree cannot restrict your innovation, vision and skills. Today, we would be talking about such five visionaries who changed not only their own lives but our world too. The pioneer of personal computer revolution, William Henry ‘Bill’ Gates III was an excellent student since childhood.Gates graduated from Lakeside School where he met Paul Allen, his future associate. He got admitted in Harvard University but quit studies to follow his ambition. Together with Allen, he formed ‘Micro-Soft’ which developed BASIC, MS-DOS and later Windows and MS-Office. Since the release of the first version of Microsoft Windows it continues to dominate the software industry till date. Gates is among the top three richest people on the earth. The mastermind behind fascinating gadgets like iPod, iPhone and iPad, Steve Jobs since childhood developed severe acrimony towards formal schooling. He loved working with different instruments and reconstruct electronics. Steve enrolled himself in Reed College in Portland, Oregon, but left his studies and got selected as the Video Game designer at Atari. With his friends, he started the company Apple computers. He drove Apple to success. Mark Zuckerberg needs no introduction. The founder and the current CEO of the most popular social networking site Facebook, Zuckerbergis a Harvard dropout. He left college to devote his complete time to the development of Facebook. Along with his friends, he developed his interactive portal which received enormous popularity from the users across the world. The number of monthly active users has reached 1.35 billion and is still on the rise. His innovative mind along with sharp marketing skills has made him the No.1 web entrepreneur of the world. Michael Dell,who made personal computers a household name, was a pre-med student at University of Texas when he started the business. He left his studies to concentrate on his fast blooming business. Initially, he sold the computers to the customers with no broker and middleman involved in the deal. Later, he founded Dell Computer Corporation and within eight years of its formation, he featured as the youngest CEO in the Fortune magazine’s list of Top 500 corporations.Today Dell has offices in more than 50 countries and has the excellent record of being world’s largest PC and laptop maker. Creator of Mickey Mouse, Donald Duck and Goofy, Walt Disney was a high school dropout. He also lost his first job for not being creative enough!Disney had initially left his studies to join the army. Rejected for being underage, he joined Red Cross as an ambulance driver. After the war, he joined a Kansas City newspaper as a cartoonist. But the editor fired himas he did not found his cartoons appealing. Disney then started his own business but that too failed. After all the initial failures, he touched gold at Hollywood.With his older brother, he started making animated feature films one after the other. Each of them was commercially successful. Till date, he holds the record of winning the maximum number of Academy Awards and nominations.Besides, he owns entertainment parks known as Disneyland in various parts of the world.